Farnham Common Nurseries, and Plant Emporium, stock a wide selection of perennials from old favourites to rare, and unusual varieties. They are good for enhancing colour, texture, and foliage, to borders. Many are good for cutting for use around the house, while others are useful for encouraging butterflies, and bees, into the garden. There are spring, summer, autumn, and even evergreen, winter flowering types to choose from. Their uses are unlimited, from the cottage garden look, right through to a more modern, contemporary style. 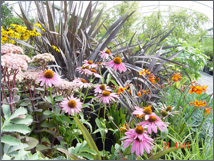 For further information on the perennials that we stock or that we can obtain for you, feel free to contact us on 01753 647710 and we will be more than happy to help.